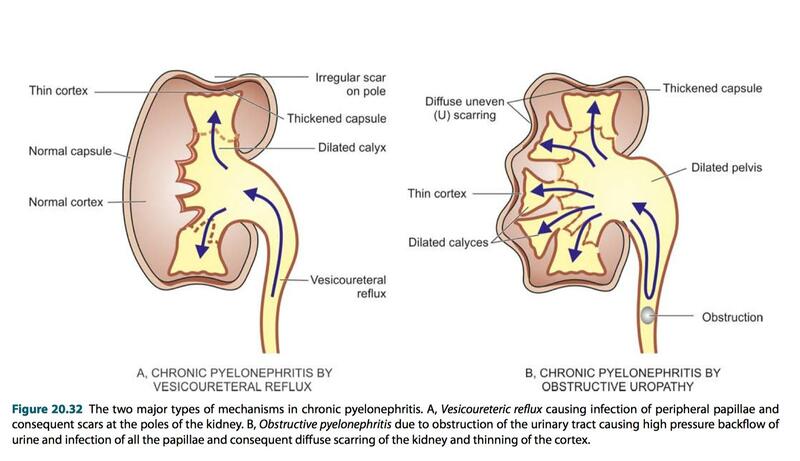 Why does infection and scarring occurs at poles in Vesicoureteric reflux but not in Obstructive pyelonephritis? It is said in Robbins that, it is due to polar papillae being flattened or concave unlike convex lateral papillae, but why is it not the case in obstructive pyelonephritis? Also why polar papillae are not convex? It's more an issue of the extent of reflux than anything else. If you look at the data on scarring, you'll see that grade III and IV VUR present with lateral scarring as well. So, any pyelonephritis that is associated with gross dilation of the ureter and collecting system will give diffuse scarring. Mild dilation, you'll get scarring where the reverse flow goes first. I can't answer the question about why the reverse flow goes to the poles first. The authors of the paper I linked have their own speculation. Robbins has another. Neither have evidence on the mechanism. Not the answer you're looking for? Browse other questions tagged human-biology microbiology human-anatomy pathology kidney or ask your own question. Why does the cold make us sick? Why is the ebola virus so intense now? Why does ALS start in middle age? Why does histamine release in Type I hypersensitivity help in case of parasites? Why proximal muscle weakness is seen earlier than distal muscle weakness in Dermatomyositis?